Tea brand Lipton pouring the bubbly in Grand Central Terminal’s Vanderbilt Hall last Friday as part of a grassroots program to promote its new, category first, carbonated Sparkling Iced Tea beverage. 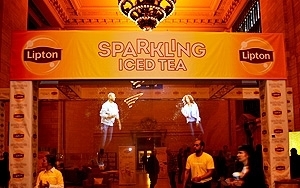 The grassroots national tour, under Lipton's “Be More Tea” campaign, centers on a installation that uses a wall-sized transparent projection screen impregnated with photo-excitable particles. What passersby see are people who appear to levitate while holding cans of the new beverage, an effect that mirrors the TV ad creative for the new product. The screen, technically a nano-optical particle diffusion screen, was positioned in front of a lounge area that Lipton did as part of the installation. The tour, which will visit events around the country, is part of a campaign that has been running for several weeks that includes advertising, consumer experiences, and social video elements. Those feature “Pitch Perfect” star Brittany Snow and the band American Authors, whose interpretation of the ’60s-era folk hit “Tiny Bubbles” is the campaign’s anthem. At the installation and at events around the country Lipton is giving out samples and cans of the Sparkling Iced Tea, which comes in lemonade, raspberry and peach. Linda Bethea, senior director of marketing, who was at the March 20 event, tells Marketing Daily that the brand is giving out over a million samples as part of the grassroots effort that has put the brand at Sundance and this year's SXSW. New digital content includes a series of short videos featuring Snow, in which she auditions for the part of spokesperson for the new tea but gets fired because she just isn’t bubbly enough. Undeterred, she shows up on set again and again to try to convince the director that she deserves the role. At one point she interrupts the band, jealous that the director finds them ebullient but not her. “We wanted someone who embodied the spirit of the brand. She hits that sweet spot,” says Bethea, adding that a number of agencies have been involved on all fronts: Mindshare, Amplitude Marketing Group, DDB, and Kinetic, which created the installation. Bethea says that while the beverages category is saturated, iced tea is “on fire. It is the fastest-growing category.” She adds that Lipton, which has leading share, is especially reaching out to consumers who are trying to cut back on soda. Currently, she says, the brand has one TV spot in rotation, in 30-second and 15-second versions, and digital content includes a “When Tea met Bubbles” video campaign on Instagram.